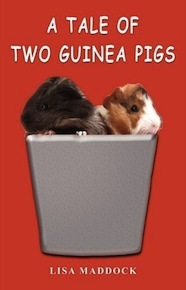 I chose A Tale of Two Guinea Pigs by Lisa Maddock because I happen to know the author. I met her because her daughter was in my Girl Scout Troop. Also, who wouldn't want to read about a book about guinea pigs? They are just so cute and it sounded interesting too. First things first about this book, it was a funny mystery, which I love mysteries, and I haven’t read a funny one before, so this was different! Molly Jane is a girl of about nine or ten and loves animals, but can't have a pet, except her bird Tweets, because her dad is allergic to animals like cats and guinea pigs (which she loves!). It also doesn't help that her parents rent out their garage/apartment to someone who has guinea pigs and won't let Molly see them. When Amelia, who owns the guinea pigs, is out of town, she has Molly's mom take care of them and Molly is not allowed to see them. Molly starts to hear them squealing from their cage, which makes her very curious. So, one night, while her mom is at a baby shower and has forgotten to feed the guinea pigs, and because her dad can't feed them, reluctantly, her parents let her. When Molly gives them their food everything comes together why they were squealing. Teddy and Pip start to talk (they are not supposed to talk to anyone but Amelia and Wally) about how they are upset about everything, Amelia, Molly's mom, being in a bucket, everything. Plus, they have a tight schedule, reading, TV, Beatles, and much more. When they don't receive their postcards from Amelia, they get worried. First this strange lady tries to maybe take or read them, something happens between Amelia and Wally (Amelia's old boyfriend), will Mom Jane figure out they can talk, and will Amelia know about Molly taking care of the guinea pigs talking to her and be ok with it? Read and find out! I really like the book because it was a cute book to read, a just for a fun book that made me laugh out loud sometimes. Some simple little jokes that the guinea pigs made, really made me laugh! The only thing that I would have liked is a bit more description on the guinea pigs' appearance and their personalities. I do not want to change them though, it is what makes them. I imagine a little Pip squealing and calm Teddy. This book would be good for grades third through about fourth grade and a little in fifth grade too. Also, any guinea pig loves too! Thank you Jaycie for this thoughtful review of my book! I really appreciate it!